Nigeria was lucky to retain its ticket to the Russia 2018 World Cup following world football governing body, FIFA’s discovery that the Super Eagles fielding Shehu Abdullahi, who was ineligible, in its last qualifying game against Algeria. 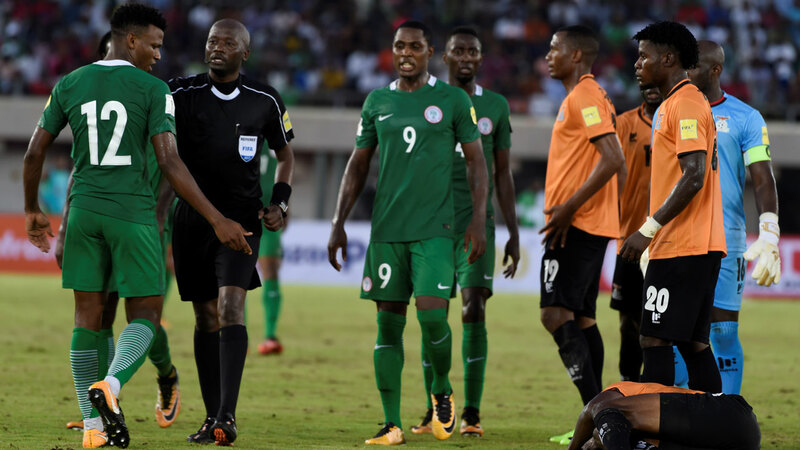 Nigeria drew 1-1 with Algerian in Constantine on November 10, but the Eagles played the game with Abdullahi, who was supposed to be serving a one-match suspension having accumulated two yellow cards. The Super Eagles saving grace is that they had already qualified for the World Cup before the game, which result had no influence in the race to Russia. A statement by FIFA made available to The Guardian yesterday reads: “The Nigeria Football Federation (NFF) has been sanctioned for fielding an ineligible player in the match between Algeria and Nigeria on November 10 2017. The match is declared to be forfeited and awarded 3-0 in favour of Algeria, with the NFF also receiving a fine of CHF 6,000. Following the decision, Nigeria’s total points tally reduced by just one, to 13, while Algeria moved from two to four points.This is not the first time Nigeria will incur FIFA’s wrath due to administrative incompetence. In 1986, the Golden Eaglets were kicked out of the 1987 U-17 Championship qualifying series when the NFF could not produce the players’ international passports before a game against Benin Republic in Ibadan. In 1993, Nigeria was also reprimanded by FIFA for its inability to produce Super Eagles jerseys before a 1994 World Cup qualifier against Burkina Faso in Lagos. Before yesterday’s sanctions, FIFA had hinted the NFF about the disciplinary proceedings, following the use of defender Abdullahi Shehu in the said match. Shehu had received a yellow card in the match against Zambia in Uyo on October 7, 2017 (the match in which victory guaranteed Nigeria a place in Russia), making it a second for him in the qualifying race, following an earlier yellow card against Swaziland in the preliminary round. Traditionally, yellow cards issued in previous rounds of the qualifying race are cancelled going forward, but the principle did not apply for the latest series. Reacting to the latest infraction, a miffed NFF President, Amaju Pinnick directed that an internal inquiry be instituted immediately and persons found culpable be dealt with. “We accept the decision of the FIFA Disciplinary Committee to fine the NFF and award the match to Algeria. “However, this is a grave error and somebody must be punished. We apologize to Nigerians for this and assure that this will not in any way derail or even distract us in our well –laid plan to ensure that the Super Eagles have a great outing in Russia.“At the same time, I want to assure that persons responsible for this slip would not be given just a slap on the wrist. We are actually looking at a re-organization of the Technical Department. The Technical Committee will henceforth play serious superintending role on all details, no matter how minute, in technical matters.“It is important that all committees and departments at the NFF should move at the same pace as the Executive Committee,” stated Pinnick.